CodePlex continua a fare passi avanti da gigante, nell’ultimo anno le nuove release e le nuove feature sono davvero tante, complimenti al team e a Microsoft per supportare un progetto così utile e direi senza eguali! 7) Inversion Of Control sample to build a security system using: WCF, Unity, ASP.NET. During the upcoming weeks we will be migrating all of the CodePlex TFS projects onto our new TFS 2010 servers. This upgrade will allow us to support new TFS features and provide increased server performance and reliability. The move will happen on a server by server basis, so expect each TFS server (TFS01 to TFS10) to be down for a few hours as data is migrated. Updates on when each server will be offline and an estimate on when they will be back online will be posted on our system outage page: http://codeplex.codeplex.com/wikipage?title=System%20Outage%20Report. As part of this migration, the URL of your TFS server will change and this will require you to update your projects source control bindings. After your project has moved, instructions on how to connect with Team Explorer to the new TFS server can be found on the source control tab of your project under “Source Control Setup”. For detailed instructions on updating your source control bindings see: http://codeplex.codeplex.com/wikipage?title=Updating%20Your%20TFS%20Source%20Control%20Bindings. Additionally, if you connect to your project using Visual Studio Team Explorer 2005, you will need to install the 2005 forward compatibility pack: http://www.microsoft.com/downloads/details.aspx?FamilyID=22215e4c-af6f-4e2f-96df-20e94d762689. If you connect using Team Explorer 2008, you will need to install the 2008 forward compatibility pack: http://www.microsoft.com/downloads/details.aspx?FamilyID=cf13ea45-d17b-4edc-8e6c-6c5b208ec54d. Finally, the TFS 2010 upgrade process checks two build templates files into your project under \BuildProcessTemplates. These templates can be removed safely as we currently do not support TF build. 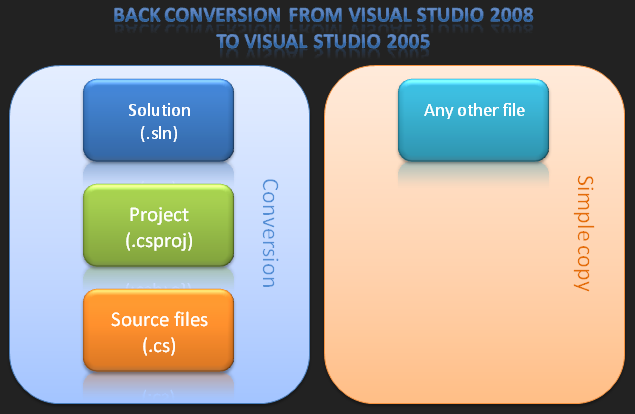 Ho scritto un tool che fa la conversione di tutti i file di solution, progetto e sorgenti (attualmente solo C#) da Visual Studio 2008 verso Visual Studio 2005. Ovviamente a patto che non si usino feature del Framework 3.x. Lo trovo comodo nel caso in cui il “cliente” non voglia/possa fare la migrazione dei progetti, ma che per questo non si debba rinunciare ad utilizzare VS2008. E’ una magra consolazione, ma meglio di niente :-). Lo trovate qui: Vs2008BackMigration.